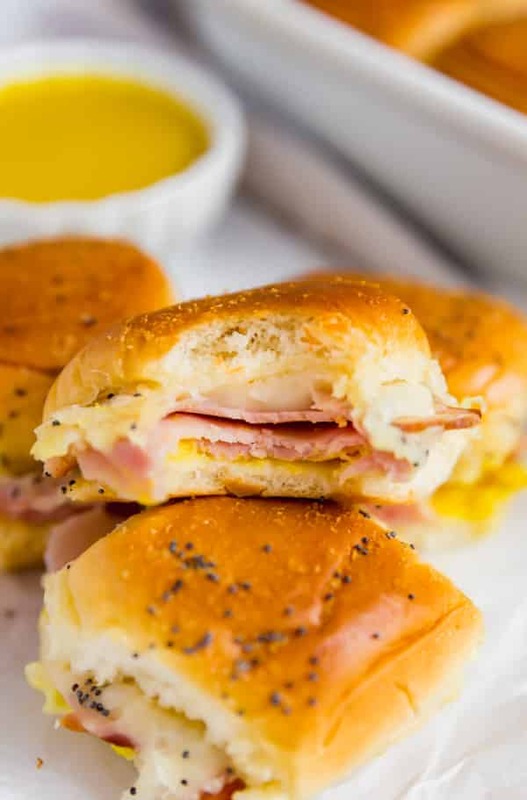 Make these easy Baked Ham and Cheese Sliders for your next party and watch as your friends fight for seconds! Mmmmmmmm, sliders! A good sliders recipe is never a bad thing to have up your sleeve. They’re quick, easy and always a hit at any gathering. 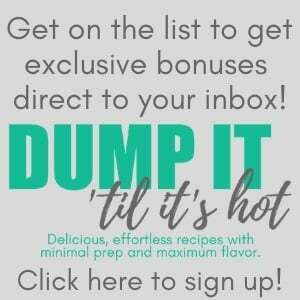 So naturally, I’m all over these kind of recipes! 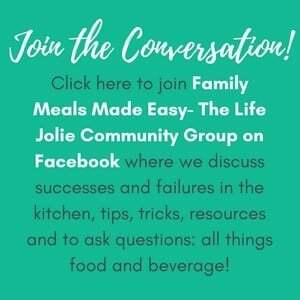 I currently have one other slider recipe on this site, my Baked Buffalo Chicken Sliders and it’s one of my most popular recipes (and with good reason- yum!). 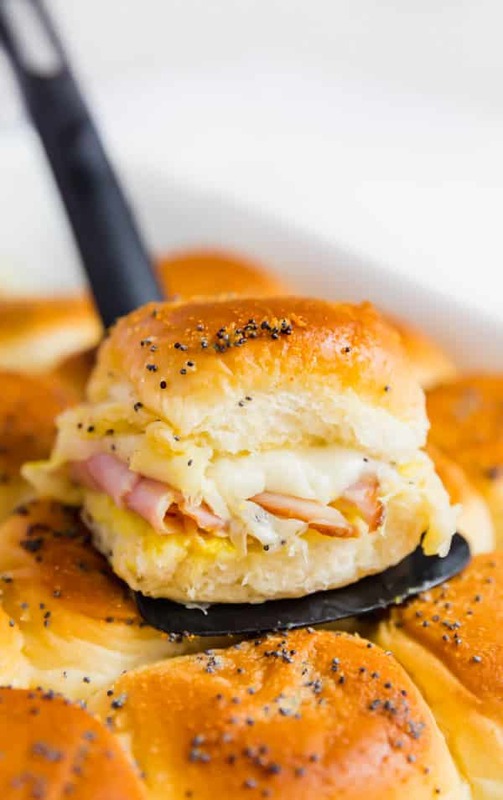 This ham and cheese sliders recipe is along those same lines. You can use ham and Swiss from your local deli and I went with Hawaiian rolls because the only thing better than regular sliders is Hawaiian roll sliders. If you can, try to keep the Hawaiian roll tops and bottoms in one piece when you cut them in half. I use a really sharp knife and slowly cut through the middle, making sure to keep an eye on both sides so as not to thin out the tops or bottoms too much. Baking the bottom buns for a few minutes helps to avoid the honey mustard sauce making the bottom buns get soggy. I gave a range of the amounts of ham and cheese slices you’ll need because each brand is a little different in terms of size. Don’t skip the butter step for the top buns, trust me! If you want extra honey mustard sauce for dipping, double the ingredients. 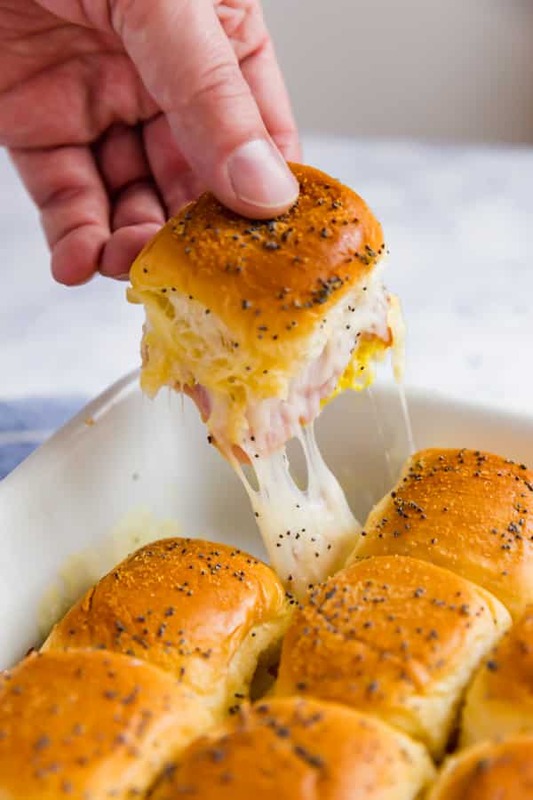 Can you make ham and cheese sliders ahead of time? You can assemble these in advance and bake them just before serving. You can also make the honey mustard sauce up to a week ahead. What if I don’t like mustard? You can leave it off, but you might want to substitute another favorite sauce because they’re a little dry without any sauce (I tested these without sauce too because my husband hates mustard!). What cheese goes best with ham? It’s totally a matter of opinion but I think Swiss goes best but if you prefer a different type of cheese, feel free to use that instead! 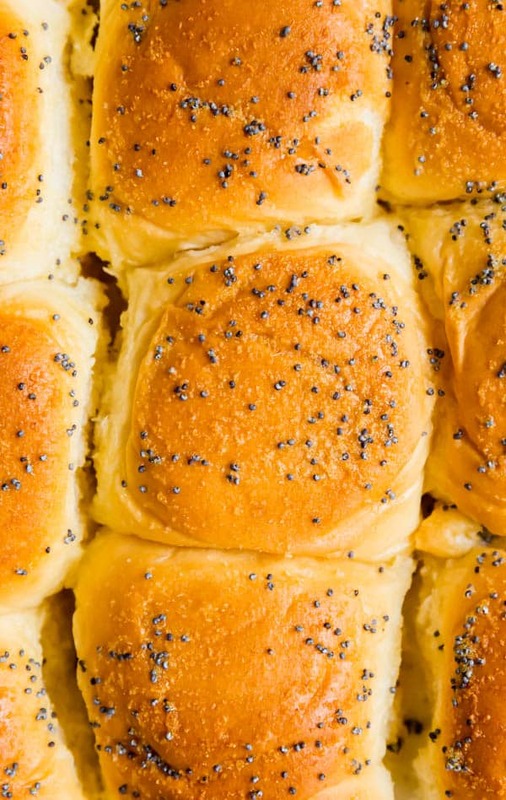 What temp do you bake sliders? I bake mine at 350 degrees. Are ham and cheese sliders good cold? These are definitely best served right away. How do you reheat ham and cheese sliders? The oven is best for this. Make sure you store leftovers covered in the fridge until you’re ready to reheat. They’ll last for 2-3 days. Preheat the oven to 350 degrees and spray a 9" x 13" baking pan with cooking spray. Set aside. Carefully cut the Hawaiian rolls through the middle trying to keep the tops and bottoms in one piece. Set the tops aside and place the bottoms into the greased baking pan. Bake uncovered for 5 minutes and remove from oven. While the bun bottoms are baking whisk together the prepared yellow mustard and honey until well combined. Spread the honey mustard in an even layer on the bun bottoms. Top with an even layer of ham. Top with an even layer of Swiss cheese. Place the bun tops on top of the sliders. In a small bowl, whisk together the butter, poppy seeds and onion powder until well combined. Brush this mixture evenly onto the tops of the buns. Return pan to oven and bake for 10-15 minutes until the bun tops are golden and the cheese is melted. Serve immediately. January 27, 2019 at 6:42 pm Yes, they're super quick! 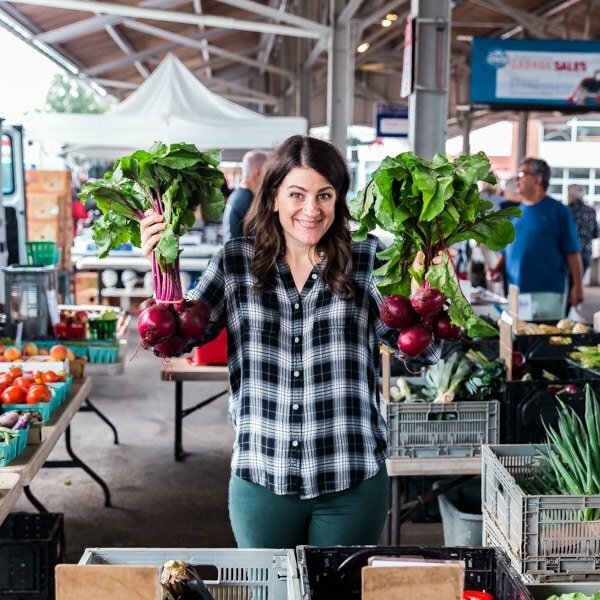 January 27, 2019 at 6:42 pm Thanks Lindsay! January 27, 2019 at 6:42 pm Thanks Dorothy!